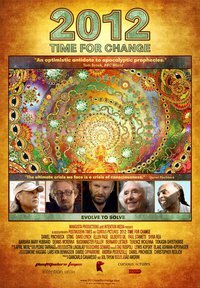 2012: Time For Change is a documentary feature that presents ways to transform our unsustainable society into a regenerative planetary culture. This can be achieved through a personal and global change of consciousness and the systemic implementation of ecological design. The Return of Quetzalcoatl, on a quest for a new paradigm that integrates the archaic wisdom of tribal cultures with the scientific method. As conscious agents of evolution, we can redesign post-industrial society on ecological principles to make a world that works for all. Rather than breakdown and barbarism, 2012 will herald the birth of a regenerative planetary culture, where collaboration replaces competition, where exploration of consciousness becomes the new cutting edge, replacing the sterile materialism that has pushed our world to the brink. Interviews with design scientists, anthropologists, and physicists such as Buckminster Fuller, Dean Radin, Barbara Marx Hubbard, John Todd and Paul Stamets and celebrities such as Sting, David Lynch, Ellen Page and Gilberto Gil. 2012 Time for Change Theatrical Trailer Large. 2012: Time for Change presents an optimistic alternative to apocalyptic doom and gloom. Directed by Emmy Award nominee João Amorim, the film follows journalist Daniel Pinchbeck, author of the bestselling 2012: The Return of Quetzalcoatl, on a quest for a new paradigm that integrates the archaic wisdom of tribal cultures with the scientific method. As conscious agents of evolution, we can redesign post-industrial society on ecological principles to make a world that works for all. Rather than breakdown and barbarism, 2012 heralds the birth of a regenerative planetary culture where collaboration replaces competition, where exploration of psyche and spirit becomes the new cutting edge, replacing the sterile materialism that has pushed our world to the brink.